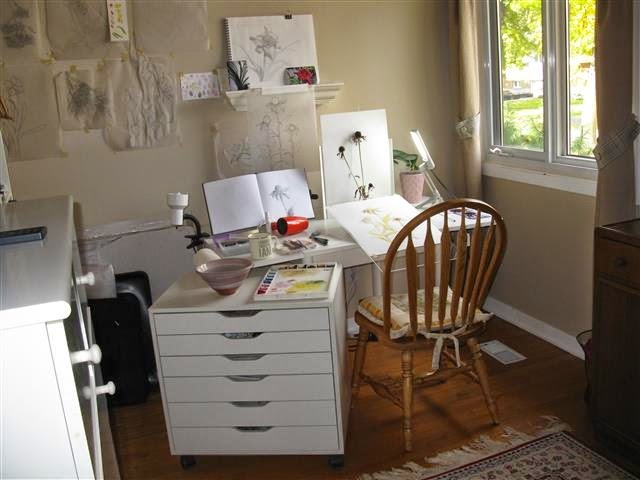 A studio space is a luxury for many artists. It can be anything from a separate rented space where one can meet with other artists, to a corner of the kitchen table. A few years ago a bedroom space in my home was no longer needed. 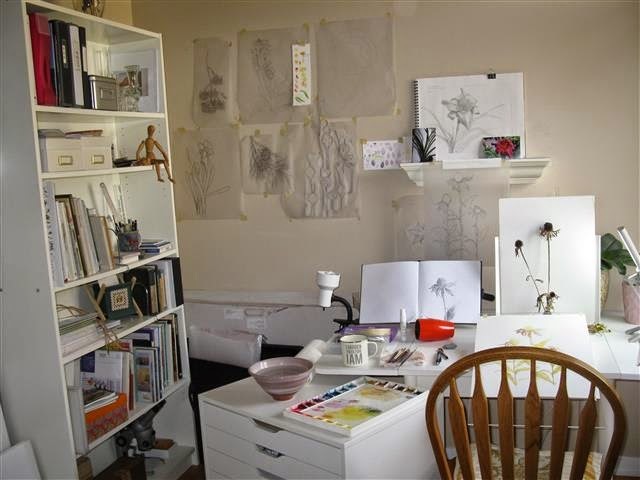 As it had a North facing window which provides ideal light, I decided to convert it into my studio. What a luxury! I no longer had to pack up all my art stuff when table space was needed, and my artwork was set up, always inviting me to enter, and “get to work”. As I am left handed, I positioned my white drawing table in front of the window, with the light coming in from my right side. Over time I have found what placement of my palette, brushes, pencils etc. works best for me. Standing on the table I have a foam-core board to place my subject in front of, to give a clear sharp background. Occasionally I pin a subject to this board if I find it needs to be raised or positioned in a way that is otherwise difficult in a vase. To the left of my chair I have a small cabinet with drawers, purchased from Ikea. Water bowls and my palette are conveniently placed on top. 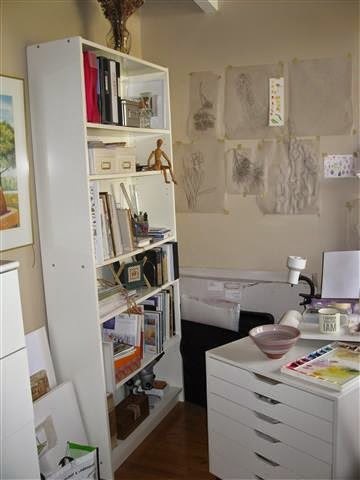 Past artwork, sketch books and colour sample pages are kept flat in the drawers. I also have an Ikea bookcase, where I can keep my art reference books and magazines, extra vases, and supplies all within easy reach. I find the whiteness of the furniture makes the colour of my artwork stand out more. 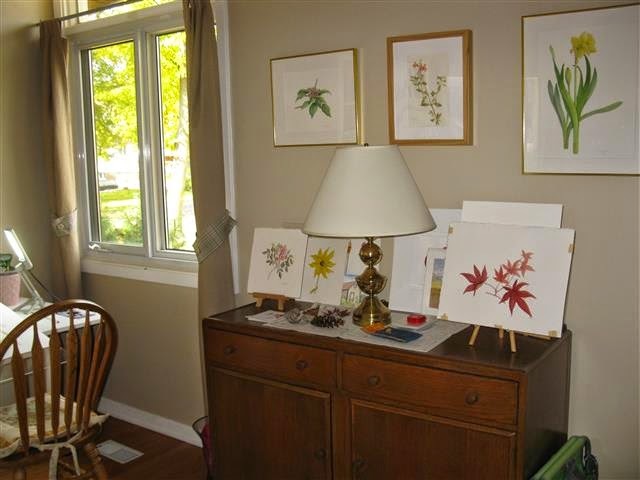 On a wall to the left of my drawing table, I have taped up tracings of artwork I am still working on. Sometimes I don’t have time to complete a piece one year. Having the tracing there reminds me that I need to pick up this piece when it’s in season again! Lastly, a very important addition to my space is my sound system. I mostly listen to classical music on CBC radio, but occasionally when I get a bit stuck with my painting, I play one or two of my favourite CD’s to help me get past this. I feel very fortunate to have my studio, and guests have commented often on what a peaceful and happily relaxed space it is.